The conceptualization of patient complexity is just beginning in clinical medicine. 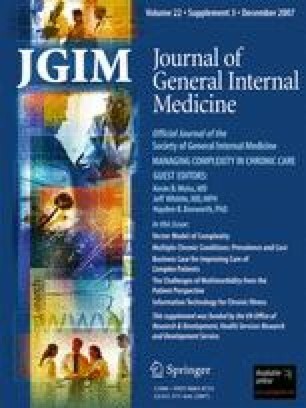 This study aims (1) to propose a conceptual approach to complex patients; (2) to demonstrate how this approach promotes achieving congruence between patient and provider, a critical step in the development of maximally effective treatment plans; and (3) to examine availability of evidence to guide trade-off decisions and assess healthcare quality for complex patients. The Vector Model of Complexity portrays interactions between biological, socioeconomic, cultural, environmental and behavioral forces as health determinants. These forces are not easily discerned but exert profound influences on processes and outcomes of care for chronic medical conditions. Achieving congruence between patient, physician, and healthcare system is essential for effective, patient-centered care; requires assessment of all axes of the Vector Model; and, frequently, requires trade-off decisions to develop a tailored treatment plan. Most evidence-based guidelines rarely provide guidance for trade-off decisions. Quality measures often exclude complex patients and are not designed explicitly to assess their overall healthcare. We urgently need to expand the evidence base to inform the care of complex patients of all kinds, especially for the clinical trade-off decisions that are central to tailoring care. We offer long- and short-term strategies to begin to incorporate complexity into quality measurement and performance profiling, guided by the Vector Model. Interdisciplinary research should lay the foundation for a deeper understanding of the multiple sources of patient complexity and their interactions, and how provision of healthcare should be harmonized with complexity to optimize health. Complex patients are increasingly common in clinical medicine. Patients made complex by multiple cooccuring medical conditions have been the focus of recent discussions, with concerns expressed about potential vulnerability created by the current approach to quality of care assessment and accountability in health care.1, 2, 3, 4 However, socioeconomic, cultural, behavioral, and environmental circumstances also contribute to complexity, but these latter sources of complexity and their ramifications have not received similar attention. In fact, there is currently no widely accepted conceptualization that portrays the numerous influences that together make a patient more or less complex. The American Heritage Dictionary defines “complex” as “consisting of interconnected or interwoven parts; involved or intricate, as in structure; complicated.” While all humans are inherently complex, some patients are more challenging to care for than others. What then makes some more complex than others? In answer, consider first the determinants of health, which include biology/genetics, socioeconomics, culture, environment/ecology, behavior, and the medical system.6, 7, 8, 9, 10 A common model is depicted in Figure 1. The associations of each determinant with health outcomes have been examined at the population level.7,11,12 However, the contribution from each determinant may vary in individual patients, and the relationships between the domains of determinants is not provided by the schematic diagram. The overall effect of the various determinants is therefore unclear. Furthermore, the model does not demonstrate how clinicians or the healthcare system should modify their interactions with patients, given the mix of determinants present, to optimize the health of the patient. To address these needs, we propose the Vector Model of Complexity (Fig. 2), using the principles of vector physics. Each health determinant from Figure 1 (except healthcare) is conceptualized as exerting its influence along an axis, which intersects with the other determinants’ axes at a central point, the patient. Complexity can exist along each axis as a force which has both magnitude and directionality, defining vector v. At any given time, a particular vector may exert a force increasing complexity, or alternatively, lessening complexity. In vector physics, an overall vector can be summed together (see also Appendix); in the Vector Model, we conceptualize overall complexity as being similarly determined by multiple components. While the summary vector in physics can be precisely calculated, we do not know the mathematical relationships between the vectors of patient complexity. Nevertheless, the concept of a formal relationship among the different domains of complexity is clinically useful: according to the Vector Model of Complexity, two patients with similar biologic complexity may present greater or less overall complexity along any given axis, at a given encounter, depending on the relative sum of vectors at that time (Fig. 2). The Vector Model provides a basis from which to examine how the sixth determinant of health, medical care, should be adapted to maximize its impact on health. Clinicians focus primarily on the biological axis consistent with the emphasis in allopathic medical education on the biology of disease; however, influences along the other axes can either augment or diminish complexity along the biological axis. This results in similar treatment plans producing different results in patients with differing complexity. Assessment of all the axes of complexity may be an essential step in developing effective treatment plans for individual patients. The interrelatedness between the axes is a key feature of the Vector Model, distinguishing it from previous conceptualizations of the determinants of health. The Vector Model explicitly acknowledges that the determinants are related. For example, recent immigrants may live in impoverished, environmentally disadvantageous locations (such as inner city slums); to have restricted financial means; and to lack health insurance. Cultural influences may exert pressures toward tobacco use, unhealthy diets, and mistrust in an unfamiliar approach to medical care. Cultural complexity therefore influences socioeconomic, environmental, and behavioral complexity. To represent these relationships, we add a web to the intersecting axes. The web has several appealing relevant features. Although they are often difficult to discern, the strands connect every aspect of the web, with each axis linked directly with all others, so that when one part of the web is perturbed, the entire web may be affected. The interconnections superficially appear tenuous, but may in fact be quite tenacious (Fig. 2). Table 1, organized by complexity vector, lists examples of factors that contribute to complexity, leading to differential effectiveness of medical treatment. Importantly, the Vector Model allows an individual’s level of complexity to vary over time, reflecting the dynamic nature of complexity. For example, individuals newly diagnosed with diabetes must make considerable efforts to modify diet and exercise, and to monitor blood sugar. Once incorporated into the patient’s lifestyle, these salutary health behaviors tend to diminish complexity at future encounters. Each encounter with the healthcare system can be thought of as a series of vector diagrams. Whether the provider and healthcare system prove helpful or effective depends upon both (1) the complete assessment of the patient’s complexity, and (2) the provider and healthcare system being equipped to respond. To better illustrate how these influences interact in patients, consider two illustrative cases (Fig. 3). Mr. Smith has biological complexity, with multiple newly recognized conditions. However, his personal, family, and community circumstances exert stabilizing and supportive forces along social, cultural and environmental axes, diminishing the overall complexity confronting his treating physicians. Mr. Smith has the means to find culturally concordant doctors whom he can trust, enhancing motivation to quit smoking, make lifestyle changes, and take his medicines. His overall complexity vector along the biological axis is low (Fig. 4), and his treating physicians need not modify their usual approach. In contrast, Mr. Jones has similar biological forces, but his other axes contribute forces toward greater complexity. Mr. Jones’ social support is much less than Mr. Smith’s. He has limited finances and may have difficulty paying for all the recommended medications, new diet, and follow-up care. He must balance his own self-care needs with his wife’s. His environment makes it difficult to exercise, and an unsafe neighborhood may contribute to stress. Mr. Jones’ overall complexity is greater than Mr. Smith’s. Without a very different approach by his treating physicians than that used for Mr. Smith, Mr. Jones may conclude that his doctors do not understand his situation, become overwhelmed, and lose motivation to quit smoking and make difficult lifestyle changes. The Vector Model of Complexity therefore explains why a disease-focused approach (that is, considering the biological vector alone) works well in Mr. Smith but fails in Mr. Jones. Explanatory models of sickness, a medical anthropological concept,13 provide a mechanism to use the Vector Model to create effective treatment plans. According to these explanatory models, “physicians diagnose and treat diseases (abnormalities in the structure and function of body organs and systems), whereas patients suffer illnesses (experiences of disvalued changes in states of being and in social function)”.14 Explanatory models of sickness fit well into the Vector Model of Complexity: they are determined by culture (national, racial, ethnic, occupational, or professional), religious beliefs, education and knowledge, social class [socioeconomic and cultural vectors]; gender, age, and personality traits [biological and behavioral vectors]. The healthcare system must also be designed to promote congruence. While some healthcare systems can provide successful care to individuals with, for example, addiction, homelessness, and culturally unique needs, others can be distinctly unaccommodating for such patients. Failure to achieve congruence between patient and provider may provide insight into why half of patients with chronic disease do not take medications as directed.18 Noncongruence may contribute to differential use of preventive services, diagnostic procedures, and therapeutic interventions by race/ethnicity, even when access to care, diagnosis, and severity of illness are similar. In fact, patient “non-adherence,” may be an excellent signal of (1) incomplete assessment of complexity and failure to modify the clinical approach accordingly, and/or (2) a healthcare system that remains ill-tooled to address the needs of complex patients. Unfortunately, physicians receive little training on how to achieve congruence. While cultural competency is increasingly being added to educational curricula, these programs have unknown success.19 In fact, it is not clear how each axis of the Vector Model should be assessed, and validated instruments to capture aspects of each axis are primarily designed for research purposes. Evidence-based guidelines are a cornerstone to guide clinical management; how well do they help physicians care for complex patients? Currently available guidelines tend to focus on single diseases and not on the needs of complex patients,1, 2, 3 a striking finding on perusal of the over 2,000 available guidelines on the Agency for Healthcare Research and Quality’s National Guideline Clearinghouse website.40 Notable exceptions include the Veterans Affairs/Department of Defense (VA/DoD) Diabetes Guideline (advising adjusting targets for glycemic control based on life expectancy) and the California Healthcare Foundation/American Geriatrics Society’s (CHF/AGS) diabetes guidelines (1) (which advise prioritizing care among multiple conditions). In fact, guidelines are almost invariably silent about clinical trade-off decisions.3 The CHF/AGS diabetes guidelines are a notable exception in their recommendation to consider more liberal glycemic control targets and greater focus on hypertension control in older diabetic patients.1 However, more typical is advice in the Expert Consensus Document on Beta-Adrenergic Receptor Blockers41 for patients with chronic obstructive pulmonary disease vis-à-vis beta blockers. Note is made that such patients do benefit, but they should be “carefully monitored” without further guidance on what type of monitoring is recommended, or which specific characteristics identify patients at particular risk. Given that evidence suggests suboptimal care, a systematic approach to assessing the quality of care received by complex patients is warranted. In fact, currently unmeasured aspects of care may be especially relevant to complex patients. Efforts to reflect a more global assessment of overall quality of care are hampered by lack of consensus on important methodologic issues, such as how to adjust for patients characteristics or create summary measures. Patients themselves may be queried, but cost and biases inherent in surveying patients are considerable. Quality measures tend to focus on single diseases without differentiation for complex patients. The VA/DoD, whose Diabetes Guidelines recognize complexity imposed by limited life expectancy, has an opportunity to construct quality measures based on life expectancy, alongside their current age-limited performance measures. The VA has become a widely recognized leader in quality and performance, thus could play an important leadership role in incorporating complexity into performance measures. Because trade-off decisions are so central to the care of complex patients, incorporating patients’ preferences becomes essential for high quality care. For example, Mr. Jones and his physician may liberalize some treatment goals to create a realistic, achievable program of care. Quality metrics do not currently include assessment of patient preferences, although important work in this area has begun and validated scales assess patient opinions about the success of various aspects of the clinical encounter in meeting their personal needs.52,53 We echo others’ concerns that the Pay-for-Performance program creates a possible disincentive to elicit patient preferences and the development of an individualized care plan2, 3, 4; if physician income is tied to the proportion of patients with HbA1c < 7%, glycemic control targets may not be the result of shared decision-making. Patient complexity has been incorporated to some extent into widely implemented reimbursement schemes, offering potential lessons for quality measurement. The Diagnosis Related Group system reimburses more for hospital stays for complicated patients based on the presence of comorbid conditions or complications. Similarly, outpatient visit reimbursement for Medicare patients is tied to the level of visit complexity, based on the number of a defined set of elements addressed, illness severity, and amount of time spent. Note that nonbiological complexity is only indirectly incorporated in the time component of this scheme. While overcoming many of these challenges requires long-term investment, several possible short-term approaches using available methods are worth noting. Stratifying measures on life expectancy, using well-established methods,54, 55, 56, 57 could include many older patients currently excluded from quality assessment. Peer-based benchmarking is another well-developed approach that could be more widely applied, and inherently accounts for complexity.58 Peer-based benchmarking compares the performance of an individual to their peer group using sound statistical methods. The lack of evidence on what is realistically achievable is an uncomfortable undercurrent in the quality industry, which often sets benchmarks by expert opinion in the absence of empiric evidence.59 The extent to which low performance among even the best performing clinicians is driven by patient complexity is an empirical question worth examining. Practice implications: Evidence and guidelines. Most pressingly, we need studies that provide data for clinical trade-off decisions: on the relative effectiveness of interventions within and across diseases, by increments of disease control, and more “real world” effectiveness studies such as the ALLHAT. More evidence synthesis studies that can model time to benefit and relative benefits39 are also essential. New evidence and evidence syntheses should be incorporated into guidelines, using the Vector Model of Complexity as a framework. Disease-specific guidelines could consider how complexity along each of the Vector Model’s axes might change recommendations, with guidance for trade-off decisions. General guidelines for the care of complex patients with advice on how to assess and address each axis of the Vector Model are also needed. Policy implications: Incorporate complexity into quality measurement and performance profiling. Strategies discussed above that could be implemented in the short term include stratifying quality measures on life expectancy,54, 55, 56, 57 with new quality measures for individuals with decreased life expectancy, and wider implementation of peer benchmarking as an alternative to arbitrary benchmarks. In the longer term, a more comprehensive assessment of quality of care for complex patients along multiple axes is needed. Specific strategies for how to create metrics to assess the care of complex patients are important areas for future work, for which the Vector Model can serve as a conceptual framework. Research implications: Multidisciplinary teams, standards for clinical trials. The assessment of nonbiological axes, the relative contribution of each axis to overall complexity, and the interrelatedness of each complexity vector require multiple scientific perspectives and methodologies, as emphasized in the current NIH roadmap. Sociologists, education theorists, complexity scientists, and experts in neural networks are some of the potential team members who might work alongside physicians and biostatisticians to carry out multidisciplinary studies on patient complexity in healthcare. This research should first develop validated methods for quantifying patient complexity along each axis, empirically determining appropriate weighting of the relative contribution of each axis. This may be followed by the development of complexity metrics for quality assessment, and include patient preferences in the metrics. New standards for clinical trials could mandate the reporting of incremental benefits and quality of life outcomes, providing a long-term solution for the knowledge gap that currently hampers evidence-based trade-off decision-making. Patients may exhibit complexity along any of several axes of the Vector Model of Complexity, which are interrelated in subtle ways. If the multiple forces of complexity are not recognized and addressed, they become barriers to reaching congruence between patient and provider, leading to nonadherence, and diminishing the physician’s effectiveness on optimizing health. A rigid, unaccommodating healthcare system can further prevent the achievement of congruence. Achieving congruence requires trade-off decisions, yet there is a distressing paucity of empiric evidence to guide such decisions. Trade-off decisions are largely ignored by current evidence-based guidelines and quality measurement systems. We urgently need to expand the evidence base to inform clinical trade-off decisions, and interdisciplinary teams need to develop methods to measure patient complexity and to integrate such measurement into guidelines and quality assessment. Our Vector Model offers a framework for this future work. We thank Drs. Carol Ashton, Stefan Kertesz, and Nelda Wray, for their helpful comments on an early draft of the manuscript. This paper was presented at the Veterans Affairs Health Services Research and Development State of the Art Conference VIII: Managing Complexity in Chronic Care, September 13–15, 2006 in Arlington, Virginia and at the Academy Health Annual Research Meeting, June 3–5, 2007 in Orlando, Florida. This work was made possible by support from the Veterans Affairs Health Services Research & Development Research Enhancement Award Program (Kiefe, PI), NIDDK R18DK65001-01AZ (Allison, Safford), and VA HSRAD IIR04-266 (Safford). Vectors can be summed in space as follows. Consider 3 vectors VBIOL, VCUL, and VSES as shown. We start with the 2 vectors VCUL and VSES. In order to sum them, we construct a parallelogram and determine its long axis. In order to find the sum of all 3 vectors, we construct another parallelogram using VSES + CUL and VBIOL. For a given health care practitioner, the focus of care is along primarily one axis. For physicians, that is usually the biological axis. The question for the physician is: how does complexity along the other axes influence the patient’s biological management at this encounter? This question can be answered by determining the component of a given vector along the biological axis. In the example above, let us first determine the component of the cultural vector that contributes complexity to the biological axis. In this example, the total complexity along the biological axis [(VCOMPLEXITY) BIOL = VBIOL + (VCUL) BIOL] is made greater by cultural complexity. Cultural concordance and high levels of trust can create a vector along the cultural axis that diminishes biological complexity. The direction of the cultural vector will be negative, and the summary force of complexity along the biological axis will be diminished compared to the biological vector alone. This same procedure can be repeated for each of the vectors present along any axis to arrive at a complexity vector that reflects the effect on the biological complexity vector of all present complexity vectors. Note that this principle of summation can be applied to any axis. A behavioral scientist will likely be interested in total complexity along the behavioral axis, an anthropologist in the total complexity along the cultural axis, etc. National Heart, Lung, and Blood Institute. Clinical Guidelines on the Identification, Evaluation, and Treatment of Overweight and Obesity in Adults. Available at http://www.nhlbi.nih.gov/guidelines/obesity/ob_home.htm. Accessed August 16, 2006. Agency for Healthcare Research and Quality. National Guideline Clearinghouse. Available at http://www.guideline.gov/resources/glossary.aspx. Accessed August 16, 2006. National Health Care for the Homeless Council. Practice adaptations. Available at http://www.nhchc.org/practiceadaptations.html. Accessed November 10, 2006. US Department of Labor Bureau of Labor Statistics. Career Guide to Industries: Truck Transportation and Warehousing. Available at http://www.bls.gov/oco/cg/cgs021.htm#conditions. Accessed November 10, 2006. Johns Hopkins Bloomberg School of Public Health. The Johns Hopkins University ACG Case-Mix System. Available at http://www.acg.jhsph.edu. Accessed August 16, 2006.